After Michelle Carter made history Friday night, it momentarily appeared as if Carter was crying. Instead, it turned out she was applying her lip gloss. Earlier, Michelle stepped into the Olympic Stadium shot-put circle wearing red lipstick, blue spandex and her trademark false eyelashes, her hair pulled into a frothy black cloud over her head. She had one throw left to overtake the greatest thrower of the last decade. One chance to seize a moment that might never come again. Carter heaved the 8.8-pound metal sphere farther than she ever had before. It landed 20.63 meters away, 67 feet, 8 1/4 inches, making Carter the first U.S. woman to win an Olympic gold medal in the event. “All I could do is just pray in that moment. ‘You know what Michelle, you have to give it your all.’ I asked the Lord, ‘Please help me give it my all,'” she said. With her sixth and final throw, Carter broke her own American record and overtook Valerie Adams of New Zealand, the older sister of NBA center Steven Adams. Adams won the silver with a toss of 20.42 meters. The only other American woman to win an Olympic shot-put medal was Earlene Brown, who took bronze in 1960. 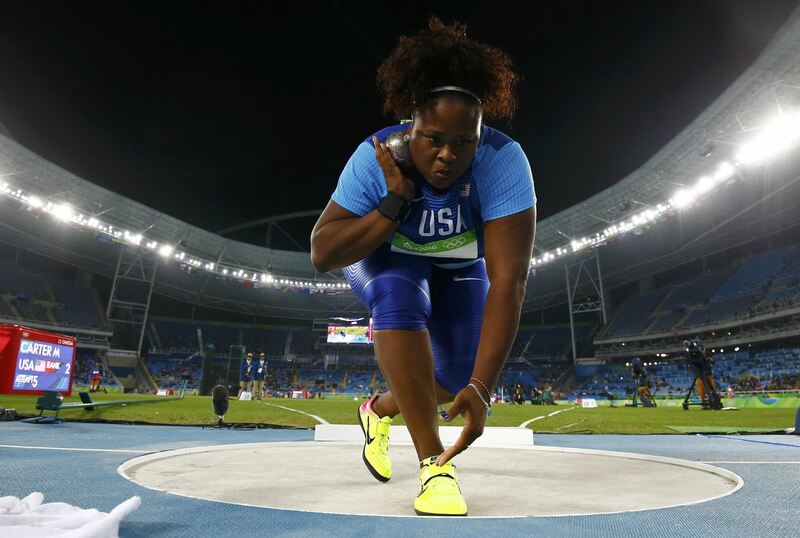 Michelle Carter (USA) of USA competes on her way to the gold medal in the women’s shot put. And she hopes her experience on and off the track will work even more to instill confidence in women with similar bodies to her 5-foot-9, 210-pound frame. “I’m in a sport that people don’t think, don’t look at us like women,” Carter said. “They don’t look at us as being girly or feminine. But I’ve been girly all my life. I couldn’t separate the two, being a woman and being an athlete. I put the two together and do what I love to do. I love hair, I love makeup, I love fashion and I love throwing the shot put. Which brings us back to the post-victory lip gloss. Aside from competing on the international track-and-field circuit, the 30-year-old Carter is a professional makeup artist; proprietor of ShotDiva.com, which sells clothes and makeup services; and promoter of the You Throw Girl sports confidence camp. She has also appeared in ESPN’s Body Issue and often posts swimsuit photos on Instagram.